"Isabelle Thornton" Le Chateau des Fleurs: Pirates of the Caribbean Tea Party! Halloween style! Pirates of the Caribbean Tea Party! Halloween style! We are Pirates today! Arggg!!!! who's idea to put a wig on me ??? Thanks Mom! Don't let her sweet smile fool you! Arggg! The small one...Small but spicy! Watch out! Ain't you a little too big for trick or treating ? Guys..Why do you tie me to a tree ? Because you steal all our candy! I still made it to the Pirates of Caribbean Party! See the Party we had last year and the Pirate ship cake!!! Seriously you need to do a book on parties. Yours are just so darn cute. I got my little grandson a Jack Sparrow wig and pirate hat when he was two. He looks ridiculiously adorable in those dreads. I wish I had something worthy to offer for your giveaways. You really outdid yourself this time, Frenchy!! I love it and I can tell by the children that they did too. The stories they have to tell at school!! The costumes are fabulous! Fun, fun, fun! What a wonderful party! The pirates costumes are great! What an absolutely fun party with everyone dressed as pirates! I love your Chinese tea set. Thank you for sharing! What a fun tea party! I had so much fun! Thank you for inviting me! Happy Halloween! Hi Frenchy, What an amazing childhood you are giving your kids!! Your parties are always filled with pure delight!! What a fun party for the kids. I'm a new follower. Enjoying your blog. Love these ideas! I'm following you back. This is absolutly amazing! I love your pirate tea party idea and the kids look like they had a blast! This was a wonderful addition to any tea party or blog party! Haha! I love the pirates party, especially the skull cake! Good stuff! Your kids are too cute! AAAARRRGGHHHHHH. Ships ahoy. what a wonderfully party full of scalliwags and skulls. How much fun it looks. Please stop by for tea and some magical fun. What fun that was! Are you not doing a frenchy week in Nov.? I'll see you in Dec. if not before. You are SO extra creative! I think you're one of the MOST fun Moms I know. Your kids are lucky to have you. You look beautiful in these photos by the way. Oh what a stunning party!!! WOW!!! you seem to have had a load of fun! Great tea party and wonderful goodies to eat. Love the skull under the glass! What a treat! A harming pirate party! What fun your family has! 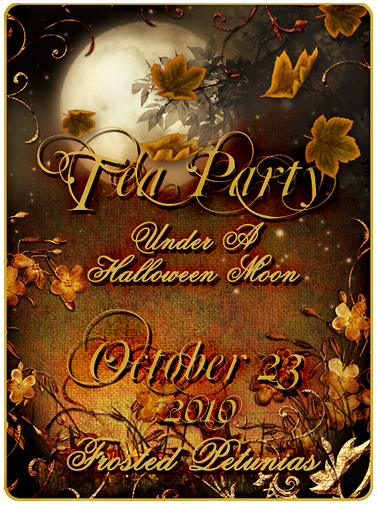 - please do come on over to our Tea Party Halloween Tea Party at http://lenorita-lenoramoore.blogspot.com/2010/10/jack-o-lantern-halloween-tea-party.html! Ahoy, what a fantastic halloween party, your motley crew look like they had a fab time, thanks for inviting me along. Such fun! Your piratey treasure be our treasure! Yo ho! Susan! French Obsession party the 1st of November....Every 1st day of the month...It is still up. Do you have a French inspired post for us ? Can't wait ! It will be fun! Thank you SO MUCH for the many compliments. You really make my day and i love you all. Thank you for your friendship! What a simply marvelous time I had at your Pirates in the Caribbean tea party. Simply wonderful!! Well those are the most adorable pirates I have ever seen! What an absolutely fun party and how wonderful that all of you get to dress up and play. Everything was so lovely. Thank you for sharing and for joining me for my Autumn tea party! What I could say is that you make this event very special!! I can only imagine their excitement and all. I had a good laugh with that photo about run hahaha. Awesome post you have here. Thanks for sharing! What fun...what's the best about it is that it is family fun. Enjoy the spooky fun this week with your family...y'all look great. Great times and great photos! Stopping by via Mommy & Me Monday. Adorable children! Fabulous tea party! How fun! Your parties always look fun! You sure do throw a mean party..what a great time. Lovely party and the kids are so adorable in their costumes , including you! Had a lovely time visiting you. Thanks for sharing all of your gorgeous inspirations and designs. I'm having a draw this coming Sunday ~ HALLOWEEN October 31st / 2010 for a tiny seashell soldered bottle, so do drop in for a visit and a chance to win. How cute is that? The whole family is dressed up and ready to party. You are creating wonderful memories. Finally catching up on all the Enchanting Full Moon Tea Parties. Love your beautiful blog & all your PICs. October 23 was my third Blogoversary, so October is a spooktacular Celebration month. P.S. CONGRATS on your hubby's Amber Alert System! Super cute party! Thanks for coming by Lucky Star Lane! Oh my! The fleurdlis necklace caught my immediately...and you are giving it away! This Saints fan will definitely be participating in your week of giveaways! It is so fun to be a mom and get to play with the kiddos...I bet your kids think you are the "bee's knees." The idea of the Pirate of the Caribbean is absolutely fantastic. Hmmm... who said, we're big enough to go around & have a treat or trick day? Awesome that you still keep the kiddie spirit in you, Bravo. Love it! Am not sure if I can join your giveaway as am living in Sweden? Or else, how I love to join you funday. What a fun party! I bet the kids had a ball. Happy Halloween! Your kiddos are adorable!! Happy Halloween. Love your party! It looks like everyone had fun! You do everything so well! It looks like a ton of fun!